In another thread we discussed briefly the Hebrew concept of Shekinah (as also seen in the Wisdom Books of the Old Testament) and whether this could be a prefigurement of our Mother Maria. Can someone please, with explanations, post the Hebrew words for These Four Holy Names, the different meanings, fittingness and significations of these Holy Names, and what we can learn from Them? 1. The commentaries for e.g. say one reason God chose to be known as Yahweh in the Old Testament was because this describes Him as the great I AM, i.e. as the Eternal and self-subsistent Being, Who alone has Being in Himself, and on Whom all other beings depend for life. This is what was most necessary in the ancient times, where the whole world had fallen into error on the Nature and Being of God, and could only be brought back to the Light by the One True God Himself. 2. In the New Testament, God reveals Himself as Jesus, which the Saints say literally means, God Our Saviour. Others who bore this Name typified Christ, but only in Him does the Name itself signify the Person and His mission(see also CCC 430 onwards). We read (Mat 1:21) "And she [Mary] shall bring forth a son: and thou shalt call his name JESUS. For he shall save his people from their sins." The name Yeshua seems to literally mean Yahweh saves. Thus, the Angel appears to be saying, you shall call the Child, Yahweh (or God) Who Saves, because the Child will be God and Saviour. Is that correct? Can our friends who are experts in the Hebrew language here please confirm? Also, I've heard it said that between another ancient form of the Tetragrammation, Yehovah (or Jehovah in Latin, and by derivation, in English) and Yehoshua (an extended form of the Name Jesus) there is only one syllable of a difference? I know no Hebrew, so I've no idea if that's true or not. So help will be appreciated. Thanks. 3. Now, we come the meaning and word Shekinah, which seems to literally mean "Dwelling of Yahweh". Is that correct? The Ark was considered this Dwelling in a special way, also the Burning Bush was considered as typifying it, both symbols of the Blessed Mother in Christian Tradition. 4. Finally the name of Our Blessed Mother in the New Testament, Mary, or Maria, this Holy Name, the Saints say has many signification, Sea of Sorrows, Ocean of Graces, Lady of Light, Beloved of God, etc. What is the word in Hebrew and is there anything in particular we can learn from it? When we read the Vulgate, we see the word Maria used to describe the Sea in the first page of Sacred Scripture (Gen 1:10). St. Montfort wonderfully reflects, in Treatise on True Devotion, "God the Father gathered all the waters together and called them the seas (maria). He gathered all his graces together and called them Mary (Maria). The great God has a treasury or storehouse full of riches in which he has enclosed all that is beautiful, resplendent, rare, and precious, even his own Son. This immense treasury is none other than Mary whom the saints call the "treasury of the Lord". 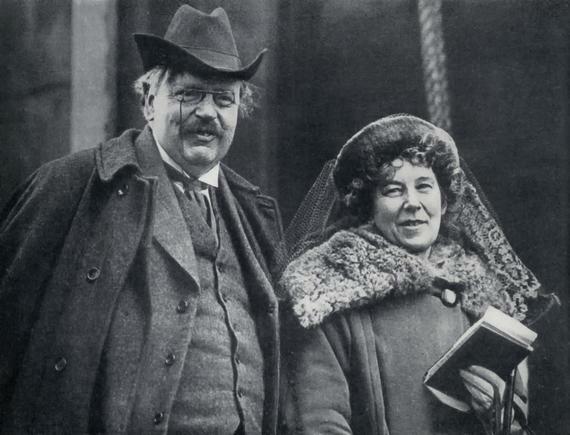 From her fullness all men are made rich." Is the "sea" analogy also present in Hebrew? 120. 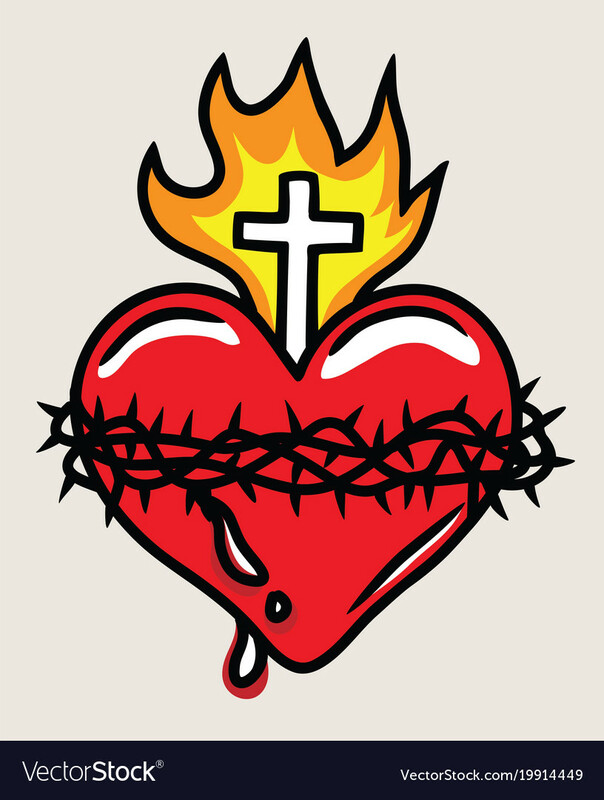 But what does the Name of Jesus, the proper name of Incarnate Wisdom signify to us if not ardent charity, Infinite Love and engaging gentleness? The distinctive characteristic of Jesus, the Saviour of the world, is to love and save men. "No song is sweeter, no voice is more pleasing, no thought is more appealing, than Jesus Son of God." How sweet the name of Jesus sounds to the ear and the heart of a chosen soul! Sweet as honey to the lips, a delightful melody to the ears, thrilling joy to the heart."! Re: Hebrew words for the Holy Names: Yahweh, Shekinah, Yeshua(Jesus), Miriam(Mary). 2. The form Yehoshua (יְהוֹשׁוּעַ) is the original form; Yeshua (יֵשׁוּעַ) is a later shortened form and is the normal form in Aramaic. The shorter form became a very common name among Levitical families. The name means "Yah(weh) is salvation/liberation/deliverance" or perhaps "Yah(weh) is opulence." 3. The meaning of "shekinah" is easier to see in its ancient pronunciation: shekhan-yah (שְׁכַנְיָה), which does simply mean "Dwelling of Yah(weh)." 4. The "sea" imagery for Mary is peculiar to Latin, due to the similarity of the Latinized form of the name with the Latin word for "sea." In Hebrew, the name Miriam (מִרְיָם) most commonly is taken to mean "bitterness" or "rebellious woman" - this meaning is most clear from the name's etymological connection with the place of bitter waters in Exodus 15:23. Some sources give possible meanings of "plump" or "longed-for child," and while the second is a nice thing to ponder, I am at a loss as to what putative root words such meanings are based on. ETA: I should say that the sea imagery is peculiar to Latin insofar as it is a pun on her name. Mem, the first and last letter of her name, means water. Also, Miriam is bit one letter’s difference from merechem, the “from the womb” of Psalm 110(109). The difference being Chet, taken as the letter of life from chaim, or pictographically a chamber, and Yud, the first letter of YHWH. The Resh is pictographically the head, or “highest”. Mem, in its two representations, is also taken to represent and open and a closed womb, pictographically. The meaning encoded in the name couldn’t be clearer. Not a Hebrew scholar, just a student of Hebrew mysticism. Mary's name is an Aramaic name, מַרְיָם‎ maryām, which is derived from an earlier Hebrew name, מִרְיָם‎ miryām. - Jewish tradition says that the Old Testament Mary (Moses's sister) was born in the days described in Exodus 1:14, when the Egyptians began to make their life bitter. So her parents named her "Mary" which is derived from Hebrew מַר mar "bitter". Presumably she's the namesake of all later Marys. - Cornelius a Lapide interprets the Aramaic form to mean "lady", from the Aramaic מרא mārā "lord" (I guess he's going with "lady" rather than "lord" because Mary is female). So Lapide concludes that the name originally meant "bitter" but that it came to mean "lady" after the Babylonian captivity when the Jews began speaking Aramaic. And if I recall correctly, he further interprets all of this mystically, associating "bitter" with the Old Testament Mary but "lady" with the New Testament Mary (hence "our Lady"). I don't think any of this makes much sense linguistically though... the feminine form of Aramaic מרא mārā is מַרְתָּא‎ martā (which is where the name "Martha" comes from). But then again, I don't know how these languages work exactly. - The explicit wordplay between Latin mária "seas" and Latin María "Mary" isn't found in Hebrew. "Ocean of Graces" is probably just "ocean", Latin mare. I think the "of graces" isn't part of the name's etymology, but is added after the name to explain what the "ocean" refers to (viz. "ocean of graces" is a paraphrase of what St. Montfort said about Genesis 1:10). - However, there is a possible Hebrew connection between "Mary" and "sea", and that's the last two consonants ים. In Hebrew, יָם yam means "sea". I don't know whether this follows the rules of Hebrew name construction, but some have interpreted the name to mean "sea of bitterness" or maybe "bitter sea", from מַר mar "bitter" + יָם yam "sea". My guess is, "sea of sorrows" is probably just a variation of this. - St. Jerome (I think he was quoting somebody else) wrote that Mary means stilla maris "drop of the sea", from the Hebrew מַר mar "drop" (as used in Isaias 40:15) + Hebrew יָם yam "sea". - This stilla maris was later reinterpreted as stella maris "star of the sea" (probably through scribal error or vowel shifts, or perhaps poetically by association with the stella polaris which sailors depended upon for navigation). - The "star of the sea" interpretation can also be forcibly read into the Hebrew name. It's a real stretch. You need to keep the יָם as sea, and then you need to read מר as a contraction of מָאוֹר ma'or "light" (a word which is used in Genesis 1:14 when describing the stars). - "Lady of Light" - This is probably not to be taken as a two-word phrase "lady" and "of light", but probably as a single-word feminine noun such as "she who is illuminated" or "she who illuminates". As mentioned above, the מר could forcibly be read as Hebrew מָאוֹר ma'or "light". But I have no idea where the ים would come from. - "Beloved of God" - This is a relatively new interpretation, from ancient Egyptian. The idea is that since some of the Hebrews at that time had Egyptian names (e.g. the names "Moses" and "Aaron" were probably of Egyptian origin), maybe "Mary" is also Egyptian. The Egyptian word for "beloved" (feminine) is mryt. Wiktionary says that some form of it was used as a given name, Meret mrt, which means "the beloved". But it's also found as a component in several names. Examples include Merit-Ptah (mryt-ptḥ "beloved of Ptah"), Merytre (mryt-rꜥ "beloved of Ra"), Meritamen (mryt-jmn "beloved of Amun"), Meritaten (mryt-jtn "beloved of Aten"), Meritites (mryt-jt.s "beloved of her father"). By using this sort of construction, we'd arrive at a hypothetical/unattested name Merityahu mryt-yhwꜣ "beloved of Jehovah" or maybe Meritneter mryt-nṯr "beloved of God". None of these sound all that much like "Miriam" though. - I've also noticed that there is an Egyptian word ym which means "sea" (probably a loanword from Semitic languages). If "Miriam" really is an Egyptian name, I'd speculate that it's possible that the ים‎ could have been transcribed from ym, though I don't know what time period ym comes from. The Catholic Encyclopedia says that somebody thinks the name comes from an Egyptian phrase Minur-juma which supposedly means "star of the sea". I'm thinking maybe "juma" is the same thing as ym. No idea. I've checked with the original source and it's in German, and it doesn't show the hieroglyphs. - Even if the name is Egyptian, it could also have a dual meaning in Hebrew. The names "Zaphneth-paaneah" and "Moses" are believed to have dual Egyptian-Hebrew meanings as well. Some sources give possible meanings of "plump" or "longed-for child," and while the second is a nice thing to ponder, I am at a loss as to what putative root words such meanings are based on. Skeptical of what? How do you propose general meanings given to letters independently of consideration of the word מִרְיָם coincidentally come together to describe the role of Mary in God's creation as the womb and chamber of the Messianic Psalm 110 (In the brightness of the holy ones, as the the morning star, from the womb (merechem) I begot thee.) that becomes the dwelling of YHWH, the highest. And this happens not just with this word, but across the ancient Hebrew language. Indeed, the T, or the Greek Tau to which it is equivalent is an upright cross. We know know that Jesus is the origin of the creation and its completion in his victory upon the cross, the seal of his covenent of the New Testament. Moreover, Jesus says he is the truth. In Hebrew that’s Aleph Mem Tav. Mem added between Aleph, the divine, and Tav, the seal; the Mem meaning literally water, pictographically womb, and in relating it to Genesis 1, the waters of the deep, material womb of the cosmos, over which hovered the spirit of God before light comes to be in it. Spirit acting on formless matter to complete creation, and truth the relation of a spiritual act to the phenomenal world expressed in the seal of a sign, also, truth as the seal of the divine spirit upon the creation. There's no "subjective" dreamign in this, and the "scientists" has to be deliberately obtuse to declare it coincidence because he cannot fit the concept of such things beign real into ones rationalistic and at leats quasi-atheistic view of the world. It's actually ridiculous how deficient in meaning translations from the Hebrew are. Even I with my minimal understanding of Hebrew can see this in verse after verse I look at. Christianity lost so much of this in its intentional distancing itself from its Hebrew essence, and egregious example of this spirit being the adoption of the 19th century German fairytale about Hebrew being a dead language in 1st century Judea, a notion totally disproved by archaeology and the work of Israeli researchers over the last several decades but still presented as "fact". The pun on lechem as bread and meat, and of dam `anabhim on wine as blood of the vine, is incredible. However, I do believe that God could have designed the Hebrew language such that there'd be hidden, mystical meanings in every word and in each letter... and if He did then there might be some truth behind pictographical readings as well as gematria. But did He? That's a question which would require experimentation and statistical analysis, and, as far as I'm aware, none of it has yet been proven. 1.) You'd need to eliminate the confirmation bias. Just because a lot of fitting patterns seem to be found, that doesn't mean that these actually are patterns. You can find seemingly-intelligible patterns in pretty much everything, if you look hard enough. To know whether these are really patterns or not, you'd need to keep track of every pattern you find as well as every time you fail to find a pattern. Then you need to statistically analyze these frequencies somehow. But as far as I know, nobody does that. They just ignore everything that's not a pattern and then proceed to gather large collections of patterns which might just be the result of chance and selection bias. 2.) You'd need to eliminate all arbitrariness from your interpretations. For example, we know that aleph is a pictogram of an ox's head. But it's not interpreted 'ox's head'; rather, it's interpreted 'God'. Now I am aware that this 'God' interpretation is derived from a Jewish tradition which views the aleph as composed of an upper yod (signifying heaven), a lower yod (signifying earth), and a vav connecting the two together, such that the aleph signifies 'union of heaven and earth' and, by implication, 'God'. I think that's how it works, anyway. But the problem is, that Jewish tradition is based on the square script (from after the Babylonian exile), not on the pictographs (from the time of Moses). My question is, why? Seems that people read aleph as 'God' rather than 'ox's head' as a matter of convenience, not because it has anything to do with the aleph itself. You'd think that aleph should instead signify only 'ox's head'. Or maybe something traditionally associated with the ox, such as 'power' or 'sacrifice'. Also, correct me if I'm wrong, but it seems some of the letters have more than one possible interpretation, and that it's up to the interpreter to decide which one to use. If that's the case, what's to stop the interpreter from just using whatever interpretation most closely says what he wants it to say? This is why I said it sounds pretty 'subjective'. You'd think that if there actually were hidden messages in the text, and if the rules of interpreting these messages are known, then (at least in theory) you could input the text into a computer and the computer would consistently output the correct interpretation. 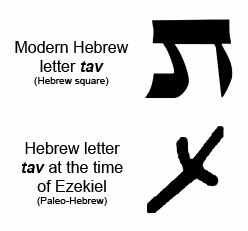 Regarding the tav mentioned in Ezechiel, and the alpha and omega mentioned in the Apocalypse, I don't see how either of those things prove that letters have mystical meanings. Theologians generally hold that the tav on peoples' foreheads was a type of the sign of the cross, so I think that much is pretty certain. But theologians have never said that every single tav, or every word containing the letter tav, has some mystical connection with 'cross' or 'redemption'. And it's a rather large jump from the former to the latter. Analogy: The 'x' on treasure maps generally signify treasure, or indicate the location of treasure. But it doesn't follow that the 'x' in the sentence "The quick brown fox..." somehow signifies treasure or indicates the location of treasure. And maybe 'Alpha' and 'Omega' was nothing more than a metaphor. That video just looks like some guy's speculation. Maybe he knows what he's talking about, but he sounds like he might be a fringe theorist. Major premise: All 'biblical characters' spoke and taught in Hebrew. Minor premise: Jesus was a 'biblical character'. Conclusion: Therefore, Jesus spoke and taught in Hebrew. But that's begging the question. The major premise is only true if Jesus spoke and taught in Hebrew, but that's exactly what the argument attempts to prove. If Jesus did not speak and teach in Hebrew then the major premise is evidently false and the conclusion does not follow. Second, "all his parables are deeply significant, and brilliantly, only in the Hebrew language". I can't comment... I don't know Hebrew. However, from what I can tell, there is a huge amount of internal evidence to suggest that Jesus was not speaking Hebrew. Because from all the words in the Gospel which were transliterated into Greek (but left untranslated), what we see is that there's a lot of Aramaic with some Hebrew loanwords. https://en.wikipedia.org/wiki/Language_of_Jesus If he was speaking Hebrew, there wouldn't be much Aramaic at all, if any. Third, regarding the 'bread'/'meat' and 'wine'/'blood', I can't comment on that either. But giving him the benefit of the doubt, that there actually is wordplay going on, I can't help but notice that Aramaic and Hebrew have a lot of cognates. Perhaps it's possible that some of the wordplay works in Aramaic just as it works in Hebrew? Fourth, "Saul says 'speaks to me in Hebrew', not Aramaic, not Greek, not Latin"... I'm not sure this argument works. Because from what I've heard, the phrase 'Hebrew tongue' in the Greek and in the Vulgate does not make a distinction between Hebrew and Aramaic. Hebrew was the language of the Hebrew people, while Aramaic was the vernacular language spoken by the Hebrew people. Both Hebrew and Aramaic are called 'Hebrew'. It's a looser term than in English. If you say, well the Hebrew for father is ox+house, which you interpret to mean "master of the house" (again, completely gratuitously), then how about mother, which is ox+water (or, chaos), according to those who argue for a pictographic meaning. So, the mother is the chaos leader? What complete nonsense! This is the essence of method of "argumentation". Actually, that's exactly what אמא leads us to, for chaos is pure potency, unformed matter, the cosmic womb, that seeded by God takes us from the divine spirit to the divine spiritual image, and מ having this meaning goes back millennia before modern interpretations of Paleo Hebrew script, and I can cite the 3rd century Sefer Yetzirah as proof, a work Dr Brown has probably never even heard of. Apparently Dr Brown doesn't even know what chaos meant to the Greeks and its equivalents, as seen in the openign lines of Genesis, to the Hebrews. For every one alleged example where you think there's some special meaning in the letters, there are ten (or 100) where it doesn't work. Yeah Dr Brown, rationalistic, empiricist Protty that you are, we're not here to fill in your lack of understanding and inability to interpret the meaning in the ten cases that "don't work" for you. Your "gotcha" example above being the a case in point of the extent of your ability to understand. No, it doesn't require statistical analysis. It requires immersion in the work and real encounter with the letters as the living beings they are regarded as in Hebrew mysticism. But the argument is academic. Eithe rone is a mystic or one isn't, and it's not necessary for salvation. You again haven't answered the analysis and accounted for how it is possible that meanings assigned to letters independently of the words can come together to give the meanign fo that words in cases where it clearly DOES WORK, like that of Merechem and Miriam. You're just waving hands and pointing to alleged psychological phenomena and vague references to chance in exactly the same way as atheists do with mystical experiences and collectively experienced apparitions and miracles. This, if anything, is not even confirmation bias, it's a priori ruling out of the very possbibility of anything but naturalism. For example, we know that aleph is a pictogram of an ox's head. But it's not interpreted 'ox's head'; rather, it's interpreted 'God'. It's been interpreted as relating to the divine spirit from the earliest Hebrew writigns on the matter. I refer again to the Sefer Yetzirah to prove that it is at least 1700 years old. Now I am aware that this 'God' interpretation is derived from a Jewish tradition which views the aleph as composed of an upper yod (signifying heaven), a lower yod (signifying earth), and a vav connecting the two together, such that the aleph signifies 'union of heaven and earth' and, by implication, 'God'. I think that's how it works, anyway. But the problem is, that Jewish tradition is based on the square script (from after the Babylonian exile), not on the pictographs (from the time of Moses). My question is, why? Seems that people read aleph as 'God' rather than 'ox's head' as a matter of convenience, not because it has anything to do with the aleph itself. You'd think that aleph should instead signify only 'ox's head'. Or maybe something traditionally associated with the ox, such as 'power' or 'sacrifice'. For lo, thy enemies, O Lord, for lo, thy enemies shall perish; all evildoers shall be scattered. But thou hast exalted my horn like that of the wild ox. Don't have time to go through this now, associations of El with the Bull historically and of the Messiah Biblically, but it's there. Also, correct me if I'm wrong, but it seems some of the letters have more than one possible interpretation, and that it's up to the interpreter to decide which one to use. If that's the case, what's to stop the interpreter from just using whatever interpretation most closely says what he wants it to say? This is why I said it sounds pretty 'subjective'. If that's what he's doing. Now show me where I've done that with merechem and Miriam and with Jesus words and et and emet. You still haven't accounted for the possibility of what I presented. "Random chance"or "subjective wishful thinking" is not an explanation. You'd think that if there actually were hidden messages in the text, and if the rules of interpreting these messages are known, then (at least in theory) you could input the text into a computer and the computer would consistently output the correct interpretation. Assuming that interpretation can be and needs to be on the basis of formal rules that can be turned into procedures for a machine to follow. Like machines can udnerstand Rembrandt, Beethoven and Dostoevsky, or even perform the rigorous process of interpreting statisticla data to derive a formalistic causal theory. More mechanistic thinking and reducing reality and truth to a lifeless mathematical process. Theologians generally hold that the tav on peoples' foreheads was a type of the sign of the cross, so I think that much is pretty certain. But theologians have never said that every single tav, or every word containing the letter tav, has some mystical connection with 'cross' or 'redemption'. Yeah, I'm not interested in what theologians think; and nobody has said every Tav refers to the cross. It's the mark of a seal, in general. It just happens that it is also the symbol actually manifested historically in the greatest sealing , or covenant, of God upon his creation. And it's a rather large jump from the former to the latter. I'm sorry, but I don't see how that is remotely analagous. Fair enough point. If you really think that in consideration fo what's presented, and that's how your mind works, then there's nothing more to say on it. Some people just see in 1s and 0s. Nope. That doesn't follow. Chaldean "loan words" already appear in the Hebrew of the Old Testament. For example, I brought this up with a Catholic apologist, who gave the same response, his example of the indubitability of Aramaic primacy being the word keph, rock, from which we derive Cephas for Peter, being Aramaic, not Hebrew; one minor problem: כֵּף appears in Job 30:6 and Jeremiah 4:29, which even predate the process of Aramaic influence. This is as dumb as arguing that English was a dead language because French loan words were adopted and appear in translations of its texts. Some do, like the Baptist's one with stones which he mentions. Hebrais, Hebraisti and other words for the Hebrew language are clearly and consistently distinguished from those for the Aramaic language; any apparent evidence to the contrary suggests at most that Aramaic might possibly be an occasional referent of these words, which as it happens (apart from John’s proper names) always denote Hebrew. Fact is, in the 1st century, people writing in Greek used Hebrais, Hebraisti etc. for Hebrew, not Aramaic. It's really time for the Catholic "mainstream" stuck in an outdated 19th century theory of Aramaic primacy to start taking note of the research of the Hebrew University of Jerusalem and also to acknowledge the clear anti-Semitic roots of this German idea to divorce Jesus and the New Testament from its Hebrew essence. Now show me where I've done that with merechem and Miriam and with Jesus words and et and emet. You still haven't accounted for the possibility of what I presented. "Random chance"or "subjective wishful thinking" is not an explanation. My explanation is this: since you already know some facts about Mary, such as the fact that she is the mother of God, then what's happening here is that you are looking to find those facts in her name. Maybe not deliberately, but there's no denying that humans tend to focus more on details which seem important while ignoring details which seem unimportant. What I mean is: Even if we assume that Hebrew letters can in fact be read as pictographs, there are still countless ways in which a person could interpret these four letters: 'water-head-arm-water'. Perhaps thousands of possible interpretations. What you are choosing to go with is but one interpretation among thousands, and the one you have chosen happens to indicate Mary's rôle as mother of God. I'm not denying the possibility that your interpretation may be correct, but what I am claiming is that I don't think you're using any sort of objective standard in choosing to go with that one interpretation rather than any of the thousands of other possible interpretations. Correct me if I'm wrong. The fact that the consonants in 'Miriam' and 'merechem' are similar doesn't really prove anything, since for that to work you need assume in advance that all similarly-spelled Hebrew words are somehow connected to one another. And maybe they are, but I don't see how anyone could possibly know that. The existence of what seems to be patterns, or fittingness, also doesn't prove anything, since you can find that sort of stuff even in English if you look hard enough. And English clearly doesn't have any mystical significance. Or, if it does, I don't see the rationale. Ok, thanks. Guess some of this stuff is a lot older than I thought. Come to think of it, I vaguely recall once hearing something about bull symbolism. Nope. That doesn't follow. Chaldean "loan words" already appear in the Hebrew of the Old Testament. For example, I brought this up with a Catholic apologist, who gave the same response, his example of the indubitability of Aramaic primacy being the word keph, rock, from which we derive Cephas for Peter, being Aramaic, not Hebrew; one minor problem: כֵּף appears in Job 30:6 and Jeremiah 4:29, which even predate the process of Aramaic influence. I wasn't aware of that. Thanks for pointing it out... I'll take note of it. Wasn't aware of this either. I can't remember the source. If anybody here knows Hebrew, could you confirm whether this rendering is grammatically plausible? It's an interesting theory... but I've never heard it before, not even in the commentary of Cornelius a Lapide who is usually pretty thorough on stuff like this. And as far as I know, scholars usually reconstruct the phrase differently than that. The "va-" ("and") part strikes me as a little odd. I'd have to dig a little to see if I can find examples of an "origin" title being joined to a title like "king" like that; it strikes me as incongruous. It also seems very unlikely that Greek would not include "and" if it were translating from a Hebrew original that had it. The Hebrew original simply omitting "va-" seems more likely to me, so that "melek" is just in apposition to "Jesus." "This [is] Jesus [the] Nazarene [the] King of-[the]-Jews"
Syriac (and all forms of Aramaic) are a little different from Hebrew in that the definite article is attached to the end of words, and in Syriac it has lost virtually all force, so it is sometimes a bit of a judgment call where to put the definite article in translation (kind of like translating Latin). But significantly to me, Syriac does not have "and" in front of "king," and Syriac and Hebrew share the same particle for "and."